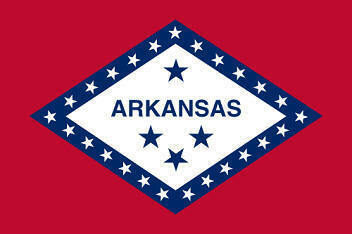 The State Flag of Arkansas is a rectangular shape and features the central white diamond shape. It serves as a symbol of honor, heritage and regional pride and is displayed at state buildings. 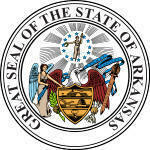 The Arkansas State Flag is also flown on national and state holidays and on any other days proclaimed by the governor. There is an Order of Precedence for flags. State Flags are displayed in order as they entered the Union. Car Flags are often displayed to represent of an individual's allegiance to their state. Arkansas State car flags are used by their owners as mobile emblems of their home. Car flags are usually made from strong materials and are attached to a car via a pole and clip window attachment. What is the design of the Arkansas state flag? What do the stars mean or symbolize? The top blue star represents the Confederate States of America, which Arkansas joined in secession. What does the diamond shape mean or symbolize? The diamond shape represents Arkansas' status as "the only diamond-bearing state in the Union". Arkansas, Wyoming and Colorado now have a verifiable source of diamonds in the US but there is only one mine - the Crater of Diamonds State Park in Murfreesboro. What is the official description as detailed in the legislature? "the diamond represents Arkansas' status as "the only diamond-bearing state in the Union"
Who designed the Arkansas State Flag? He entered a competition to design the flag in 1912. The ensign design submission by Willie Hocker beat 65 other entrants. What is the history of the Arkansas State Flag? In 1924 the flag was modified to display the Confederate star above "ARKANSAS"
"I salute the Arkansas Flag with its diamond and stars. We pledge our loyalty to thee"
The Arkansas flag is kept and used as required by the code specified in the constitution of the state.